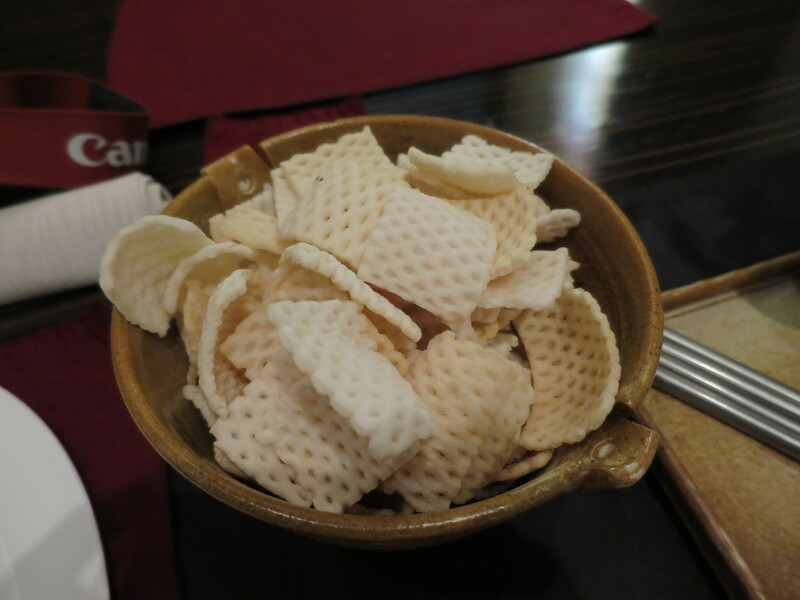 While in Hyderabad, I suddenly had this craving to eat non-Indian food for a change. Vivanta by Taj Hyderabad offered me the chance. 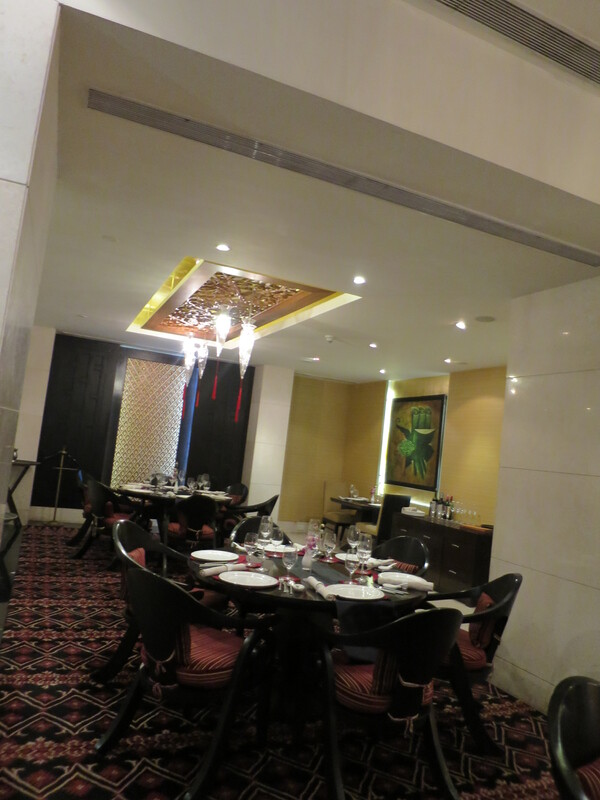 I was hosted to a dinner at the Thai Pavilion Restaurant there. This was my first experience eating Thai food in India. I went there quite sceptical about it, but trust me, at the end of it all, I left feeling very pleased and full. At the Thai pavilion, I met up with Executive Sous-Chef Arjun Yadav who was born in Hyderabad, but grew up in Delhi. 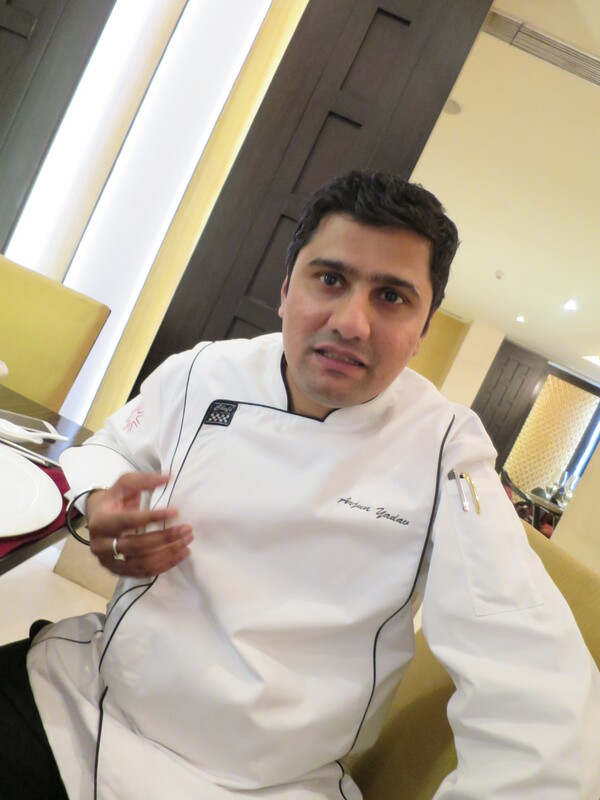 He started his culinary career with the Taj Coromandel, Chennai in 2004. A very passionate and ambitious chef, he is an integral part of Vivanta by Taj, Begumpet since its inception. Helping him at the Thai Pavilion was Chef Benjamin who has a few years of Thai cooking experience at the Oberoi Grand Kolkata. 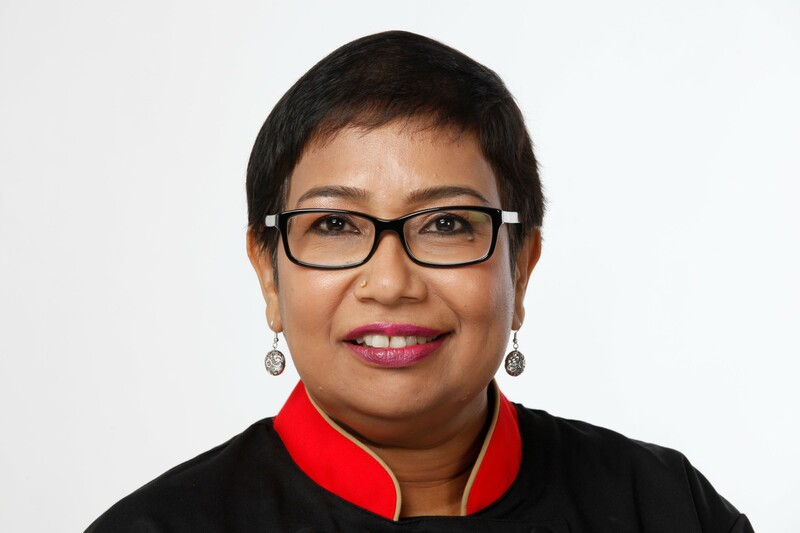 The Thai Pavilion brand was originally created by the iconic Chef Ananda Solomon of the Taj group of hotels. The interior was designed by Singapore based architect-interior designer. Thom Catallo. The ambience is contemporary and not very Thai. The furniture and furnishing is elegant. 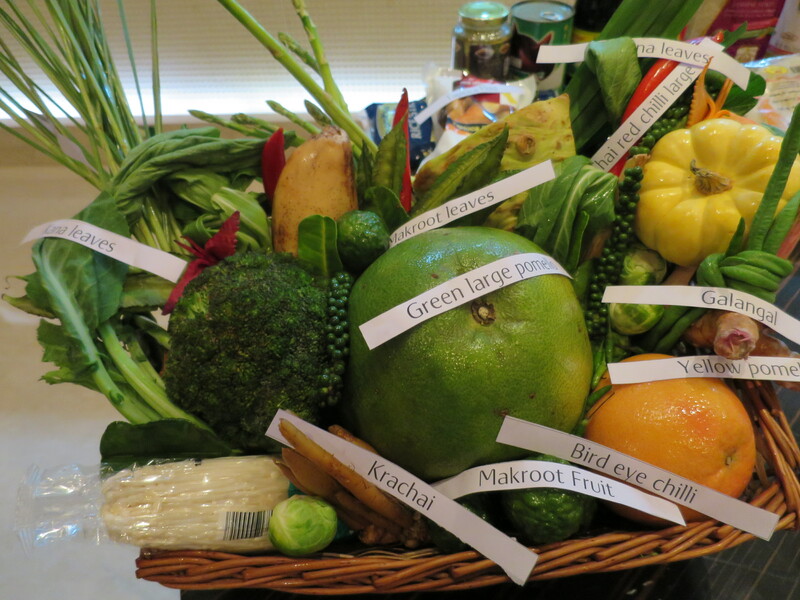 Both chefs set up a table of Thai ingredients- vegetables, herbs, spices and sauces. They even had them labelled. Everything was arranged very attractively. 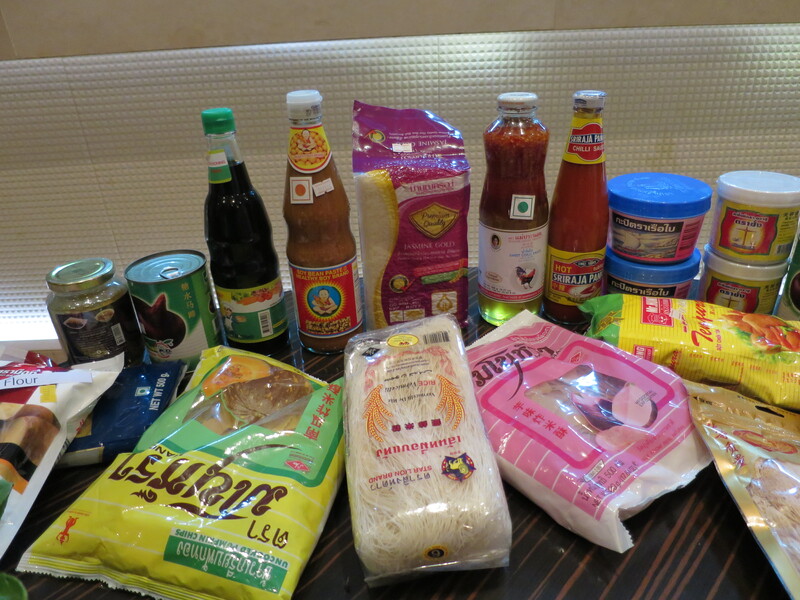 Most of the ingredients used at the Thai Pavilion are imported directly from Thailand. 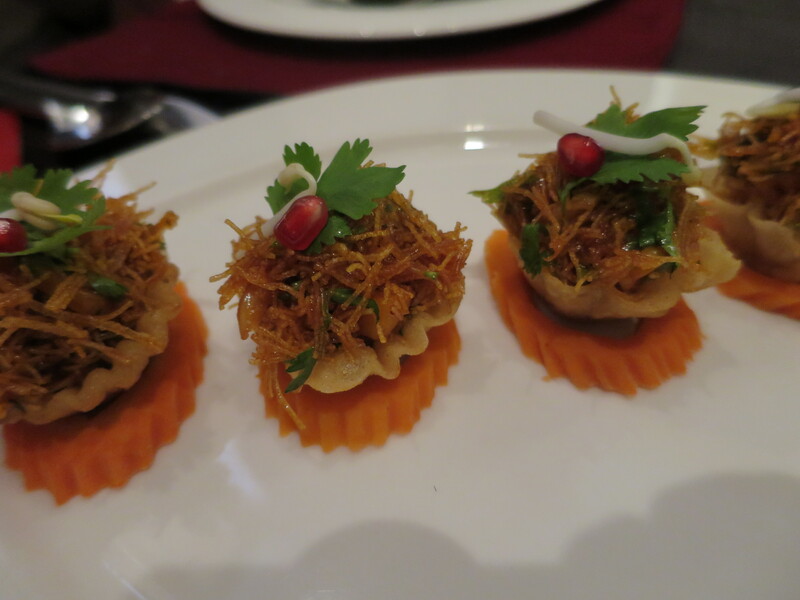 Chef Arjun had arranged for me to taste several Thai dishes. Indeed, I was overwhelmed not only by their hospitality, but also by the number of dishes they had prepared. The waiters who served me were knowledgeable as they were able to explain to me in detail how the dishes were prepared.. One particular overzealous waiter so overly excited to serve me that at one point I felt so uncomfortable. The Som Tam or raw papaya salad made with julienned raw papaya, pounded bird’s eye ,chillies, garlic, tomatoes and long beans tossed in a dressing of freshly squeezed lime juice and flavored with grated palm sugar and fish sauce was such a palate tickler! 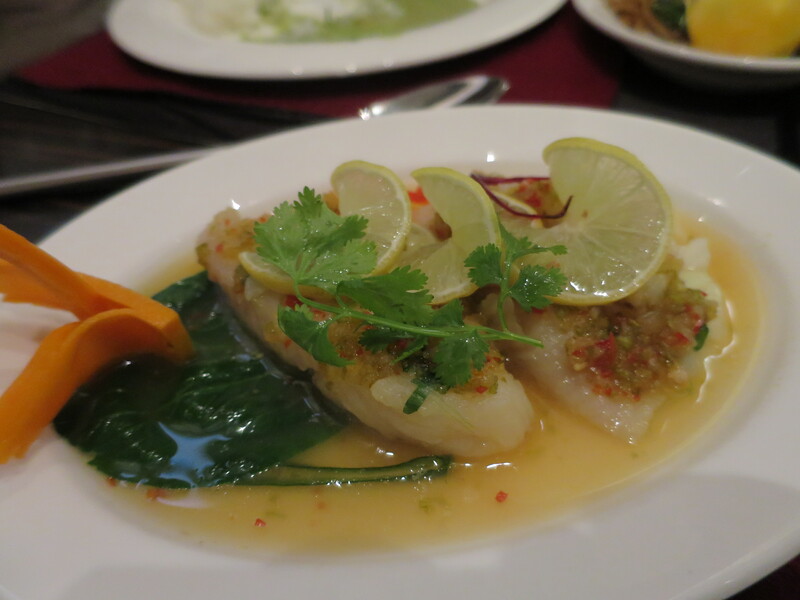 It had all that typical sweet, tangy, sour, spicy taste of Thai cuisine. 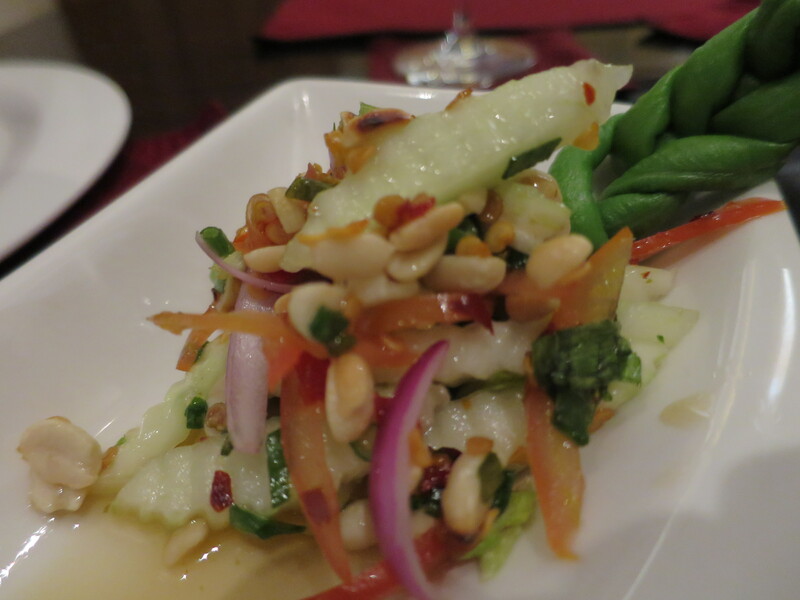 The papaya was crunchy too, unlike some restaurants that tend to make it very mushy which I don’t like. The Tom Yum soup filled my nostrils with the aromas of kaffir lime leaves, galangal and coriander roots. The sting of the bird’s eye chillies hit me after five mouthfuls. 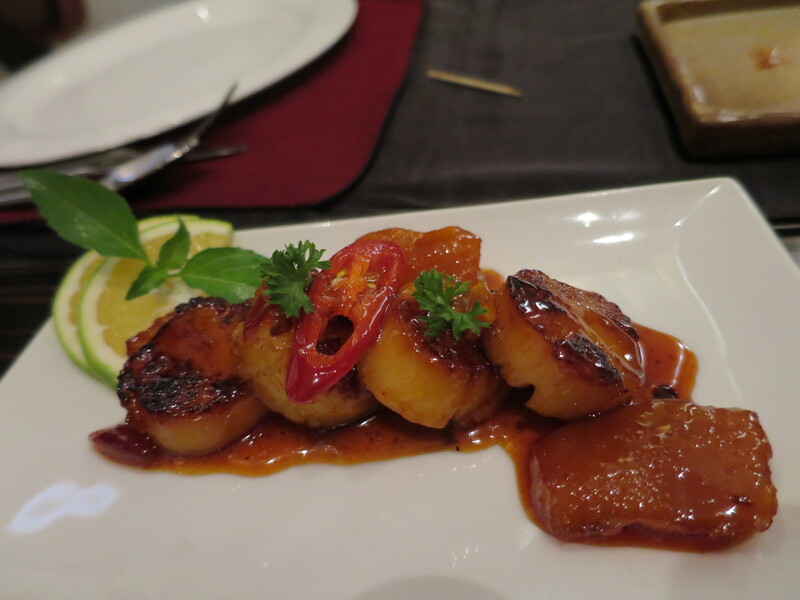 I The Scallops with Orange and Rice Wine Reduction is something I have never tried in any Thai restaurants before. It did not taste authentically Thai, but is certainly a dish I would recommend if you like scallops with a tangy sweetish flavour. The sticky citrus fragrant sauce was finger licking. The Green Curry was a little heavy with coconut cream. Besides these, I also tried a noodles dish with vegetables and lots of sweet basil. Though this dish tasted yummy and had a Thai flavour because of the Thai sweet basil leaves, it did not have the robust taste or the flavour, taste, and “essence” imparted by the hot iron wok on food during stir frying. Somehow, many of the South East Asian stir fried dishes taste better when cooked in an iron wok. 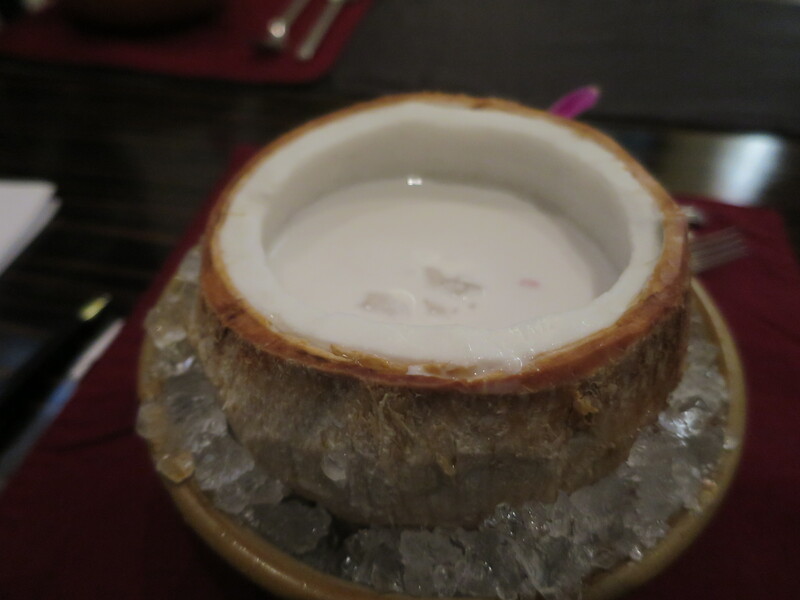 For dessert, I had Tub Tim Krob (diced water chestnut in coconut milk) served in a young coconut. The cool, sweet coconut milk was soothing after all the spicy food I had and so I lapped up all!